Overview of Cardiovascular Aging (V. Somers). 2. Lipoprotein Metabolism and Molecular Pathogenesis of Atherosclerosis (N. Sakai). 3. Cytokines and the Pathogenesis of Atherosclerosis (G. Krishnaswamy). 4. Endothelium-Mediated Signaling and Vascular Aging (T. Luscher). 5. Nitric Oxide, Gender and Hypertension (S. Taddei). 6. Alterations of Ion Channels in Vascular Muscle Cells and Endothelial Cells during Hypertension and Aging (Y. Ohya). 7. Extracellular Matrix Changes and Vascular Smooth Muscle Signaling (E. Wilson). 8. Mitochondrial Electron Transport and Aging in the Heart (C.L. Hoppel). 9. Superoxide, Superoxide Dismutases and Cardiovascular Dysfunction (D. St. Clair). 10. Aging and the Red Cell (J. Rifkind). 11. Hyperhomocysteinemia and Cardiovascular Aging (M. Cattaneo). 12. Interactions of Selenium, Vitamin E, and Vitamin C in Atherosclerosis (J. May). 13. Dietary Antioxidants and Cardiovascular Disease (T. Hagen). 14. Extension of Cardiovascular Healthspan by Dietary Restriction: Molecular Mechanisms (M.P. Mattson). 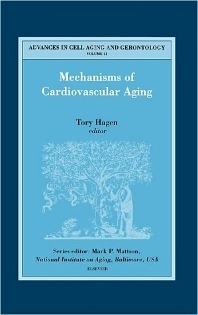 This volume of Advances in Cell Aging and Gerontology provides a timely review on the molecular and cellular basis of cardiovascular diseases (CVD). Age itself is the leading risk factor for cardiovascular diseases, which include loss of vasomotor function, athero- and arterio-sclerosis, hypertension, congestive heart failure and stroke. Together these pathologies comprise the leading causes of permanent disability, hospitalization and death for individuals over the age of 65. Thus, there is a critical need to assess both the age-associated causes leading to CVD as well as the current state of knowledge on preventive regimens designed to slow or modulate disease progression. This book concisely summarizes the current knowledge related to the major aspects contributing to cardiovascular disfunction in the elderly as well as potential ways of maintaining or improving human cardiovascular healthspan.